Interlocutor: There is another issue which is very important to address about healing. The specific question is: To what extent somebody could heal a sick person? Johnakan Ur-El: Healing exists, but what don’t exist are those alleged healers, incarnated beings who claim they can heal people per se. 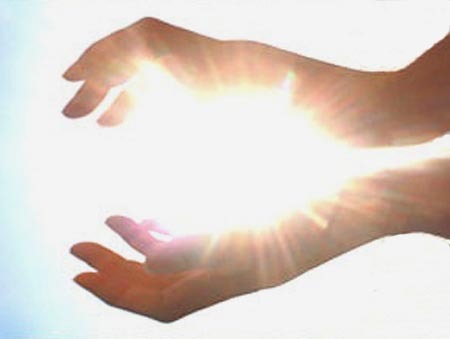 Healing is possible through the power of Light, the Cosmic energy. Interlocutor: What about the miracles of Lourdes? Johnakan Ur-El: Most of them were only myths. Interlocutor: I’d like to know if a person can be healed through suggestion. Johnakan Ur-El: No, it is not through suggestion. My vessel has healed a child of eight months old and in this case obviously it couldn’t have been done due to the influence of faith and the so-called placebo effect. He has transmitted directly the Cosmic energy, the energy of the Absolute, and he has healed this person. Interlocutor: Then Jorge is a healer! Johnakan Ur-El: No, he is not a healer, because a healer would heal at any moment. And these are isolated cases. There are other cases where, due to the free will of God, the Absolute disconnects (so to speak) that energy. In fact the energy of the Absolute is not disconnected, but the Absolute cannot heal because that person has to go through certain karma or he/she must disembody. Many times the same being chooses to go through a certain disease in order to learn a karmic lesson and reverse karma. Johnakan Ur-El: He’s a total fraud. People could have been relieved only through placebo effect. Most people who appear on television as healers are a fraud. Interlocutor: But if you talk about ‘most of them’, you are indicating that some people are healers. Johnakan Ur-El: Obviously. I said that healing exists, and if healing exists is because there are healers. But the healer is only a vehicle. Interlocutor: Which is the technique used by the healers in order to heal? My vessel transmitted Light energy to his chest and he brought him back to life. Interlocutor: What kind of energy is this? Johnakan Ur-El: It’s the energy of The Absolute (Eon), the Cosmic Energy, it’s the energy that can be found in the Planes of Light, it’s an esoteric energy. Interlocutor: Could you give me the name of a historic healer? Apart from Jesus, of course. Johnakan Ur-El: The same Francis of Assisi has performed healings. Interlocutor: Can that healing energy remove engrams? I stress the word "remove". Johnakan Ur-El: No, because healing only changes the auric vibration. The healer transmits Light energy in order to harmonize the auric vibration. When the auric vibration vibrates harmoniously, it causes that damaged cells could be healed. Healing does not heal the body directly, but indirectly, It heals the aura and later on the healing is evident in the physical body. Similarly, when the aura is disharmonious, it transmits a negative radiation and then the cells become sick. But not in all cases healing can be achieved. If there is a broken bone or a heart valve is working badly, even harmonizing the aura these physical problems are not going to heal. There are no miracles in healing because miracles don’t exist. So, not always the auric vibration is going to be able to transmit the order so that the cells heal. For example, when a physical body has very damaged neurons and the person has a problem that causes the brain to be malfunctioning, or if there is some motor dysfunction in the brain, in these cases healing is impossible. Healing cannot be achieved because it would be like trespassing the physical laws of the Creation, under which the same Absolute is subjected. Interlocutor: Will we conclude with the topic here? Johnakan Ur-El: Yes, but not without stressing, in order to avoid creating false expectations-by which I myself, Johnakan Ur-El, would create karma, there are cases that are irreversible because, perhaps the person has to go through a certain condition, because he/she has chosen to go through certain experience from the spiritual plane before incarnating in order to learn a particular lesson and compensate karma, or because the physical organism is very damaged. Johnakan Ur-El: It is not entirely a valid example, because the wall can be fixed, but the physical body cannot be fixed at the moment, the technique has not been developed yet. Interlocutor: But in the future that is going to happen? I guess that advanced aliens have already developed this technique. Johnakan Ur-El: Absolutely. The aliens have devices with which they can dissolve blood clots in places of the brain which are practically inaccessible to surgeons. But in the not so distant future they will achieve it. Interlocutor: Well, I think the topic is over, at least for the moment. This entry was posted at Thursday, April 05, 2012 and is filed under Medical Science, Therapies . You can follow any responses to this entry through the .